Do you know the story of The Stick? It’s a beautiful story because it illustrates to an adult, a child’s imagination. 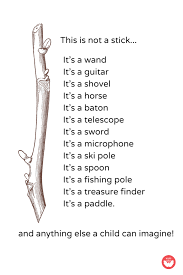 A child can imagine more things that a stick could be in a second than an adult can imagine in half an hour. It could have just as easily have been the broken plastic storage hanger that makes a bow and arrow, a guitar, a light sabre, a wand or ladybug tamer. A recent article posed the question as to whether children today use their imaginations as much as we did when we were kids. A. Do you see your child spinning incredible tales and stories in fantasy play? B. Do you see your child’s fantasy play seem to consist only of repetitive movements (like karate chops or ballerina spins) that don’t tell a story? Why is it important for it to be A more often than B? If someone grabs your toy away from you when you are four, you need to be able to imagine different ways to handle the situation. Sharing or using your words would be choices a child could imagine. If the child can’t imagine the possibilities, he or she will probably just punch the other kid to get his or her way – or just run away and cry. If a teen needs to figure out the answer to a 9th grade geometry test question, he or she will need to be able to imagine the possible solutions. If the teen can’t, he or she will undoubtedly fail, cheat or decide not to care. As adults, the ability to use one’s imagination is important. After all, who is it that imagines new ways of creating a peaceful world? If adults can’t, then what does the future hold? To create a child with an imagination who will become a teen and an adult who can use that imagination, he or she must be given the opportunity to develop it. These opportunities are found in one place and one place only: in play. Playing with paints, play dough, costumes, crayons, glue, pets, inside and outside, making a mess. Splashing in a puddle. Exploring the woods. Wondering how bees fly, how caterpillars inch along and squirrels hang effortless with their tiny feet. 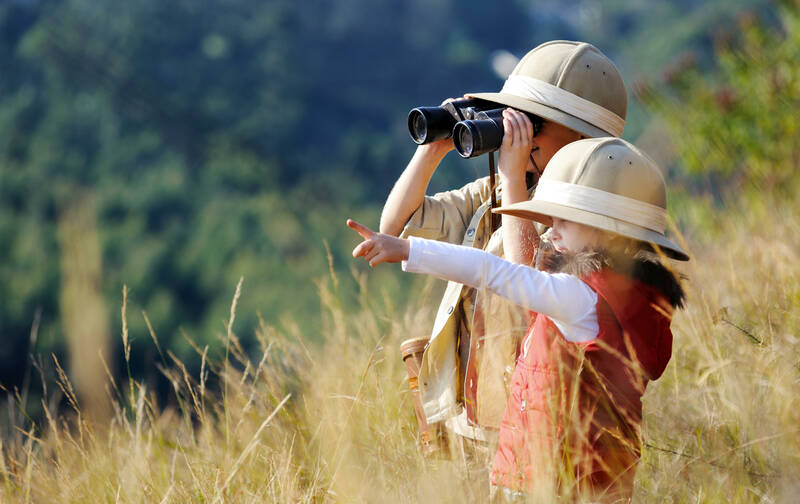 Many things can spark a child’s imagination[link to Ways to Spark Your Child’s Imagination]. Allowing a child to lead their own play [link to Difference in Games]: pretending to be a bird, lying in the grass and looking up to imagine faces in the clouds.